Mar 31, 2015 — I have big news for you. Today I can tell you that Ghoncheh is free! As we were celebrating Iranian New year, Iranian Government wiped out the rest of my sister’s sentence. 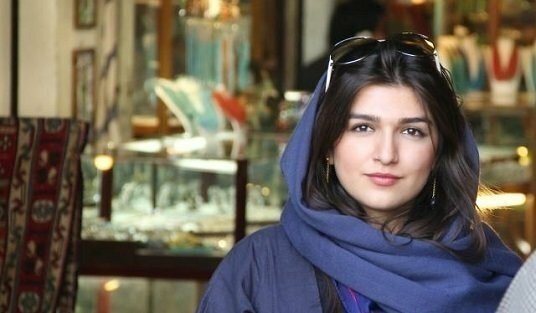 Ghoncheh will not have to spend another day, another hour in prison. This is amazing news and I wanted you to hear from me directly. You stood by us during those difficult months. You gave my family courage and hope. The uncertainty of autumn and the dark clouds of winter have gone. And the sun once again is shining for my family. Spring is here. My mum has finally become her old happy self and has found peace again. My mum and I will not forget your generous support and thank you sincerely. Together we brought Ghoncheh home. Ghoncheh also asked me to thank you all for your support. This has been the best spring for my family. Hopefully this spring brings happiness and peace to all Iranians and all of you. I have no idea if the petition had anything to do with it or not, but who cares; it’s good news. About those low numbers of women in STEM fields. It’s a pipeline problem, right – more recruiting will fix it? Or it’s not a problem at all, it’s just what women choose, because they want to Spend More Time With The Kids. Right? Not according to Joan C. Williams. Several new studies add to the growing body of evidence that documents the role of gender bias in driving women out of science careers. A 2012 randomized, double-blind study gave science faculty at research-intensive universities the application materials of a fictitious student randomly assigned a male or female name, and found that both male and female faculty rated the male applicant as significantly more competent and hirable than the woman with identical application materials. A 2014 study found that both men and women were twice as likely to hire a man for a job that required math. What mean “social justice warrior”?? Brian Leiter has only just discovered the term “social justice warrior,” and has had its meaning explained to him by someone with what looks to me like an incomplete (or tendentious) understanding of it. Functionally defined, “SJW” designates someone who monitors cyberspace for slights or miscues that reveal bias, and then exploits the various tools of social media to shame the offender, express outrage, and summon the digital mob, whilst achieving for themselves a righteous fame that ties their identities and their actions to the heroes and achievements of the civil rights movement, the landmark moments of which preceded their adulthood. SJWs divide the world, GWB-like, into the evildoers (“shitlords”) and the oppressed, with the possible, but problematic remainder, being allies, whose status is ever tenuous and usually collapses into shitlord. SJWs do not distinguish between major and minor offenses — unintentionally using “transgender-ed” instead of “transgender” is as unforgivable as any other act of oppression — nor do they distinguish repeat and systematic from first-time offenders. They employ a principle of interpretation that is something like the opposite of charity. (If the utterance gives offense under one interpretation, that interpretation is correct.) It is a harsh “justice”. News Asia reports on the water shortage in Taiwan. Taiwan will further tighten water supply as the island is suffering from its worst ever drought. Starting April 1, Taiwan will cut water supply in the northern Xinbei and Taoyuan cities for two days a week. Nearly 3 million people are expected to be affected. Taiwanese Premier Mao Chi Kuo said: “Based on what the Central Weather Bureau has told me, this is probably the worst drought in Taiwan’s history.” Taiwan started a second phase of water rationing in February by restricting supply to industrial users by 5% in nine cities and counties. But the efforts have failed to ease the drought as water levels for major reservoirs across the island continue to hit new lows. For instance, Shihmen Reservoir – a key to water supply in northern Taiwan – now has less than 44 million tons of water, which could run out in 40 days without rain. Drought is really frightening. Drought means crop failures, and crop failures mean famine and war. Drought also means death from not enough water to drink. Lynn Paltrow on the implications of the conviction of Purvi Patel. The prosecution and verdict in this case demonstrate that, despite their claims to the contrary, the real result of the anti-abortion movement —if not the intended goal—is to punish women for terminating pregnancies. Dr Jen Gunter discusses the Purvi Patel case from the point of view of an OB who wouldn’t dream of calling the police on a patient and is appalled that some would and do. For those unfamiliar with the case Ms. Patel received no prenatal care and was an unknown gestational age when she delivered at home. She thought she had delivered very prematurely and that the baby was stillborn. Not knowing what to do, ill from bleeding, and psychologically affected from delivering unassisted in her bathroom she deposited what she thought was a pre-viable stillbirth in the trash. Ms. Patel continued bleeding and so sought care at the hospital and what happened next should frighten everyone. After determining she had been pregnant the medical staff called the police and one of the OB/GYNs, Dr. McGuire, abandoned her to search with the police. Because that’s what doctors do, leave patients and play junior CSI. When the body was found Dr. McGuire told the officers he believed the fetus was 30 weeks, even though he had no qualification to make that determination. These actions starting the ball rolling as a potential homicide. Guest post: How does a rain soaked island have a drought if there isn’t climate change? Originally a comment by left0ver1under in The withdrawing room. I make it a point to avoid rants, profanities, insults and “aggressive words”, but there are times when some people deserve to be called blankety-blanks and smacked across the face with frying pans. Poor Saudi Arabia. The BBC reports it doesn’t want Daesh luring away its people or bursting in to attack the Saud family itself. But how is it to go about resisting it when they have so much in common? According to the Ministry of Interior, some 2,600 Saudis have joined extremist groups in Syria since 2011, around 600 of whom have returned. Last year alone, 400 were arrested in relation to IS activities inside the Kingdom. Hm. Time for some Stupid Posters, because I have seen some and I wouldn’t want them to go to waste. You can see them yourself if you visit the Facebook page of someone who calls himself David Avocado Wolfe. Yes, he really does. He says he’s a public figure, too. Well I don’t believe that. CFI has a statement on the horrific murder of Washiqur Rahman. Barely a month following the brutal murder of our friend, freethought writer Avijit Roy in Bangladesh, and the near-killing of his wife Rafida Bonya Ahmed, atheist blogger Washiqur Rahman has been killed by a group of Islamic extremists in Dhaka. A young man at age 27, Rahman was far less well-known than Dr. Roy, but his public expressions of admiration for Roy, and his courageous criticism of religion were sufficiently threatening to these extremist thugs that they tried to silence him as they silenced Dr. Roy. But they will find that just as was the case with the murder of Dr. Roy, the power of the ideals and principles Washiqur Rahman championed will now only become a more potent force, and the hateful and backward ideology of his killers will be exposed to the world. Violent Islamic extremists think they will scare their critics into silence and submission, but their barbarity will only serve to strengthen the unity and resolve of those who believe in the fundamental right to free expression — which includes the right to criticize, question, and reject religion.